Over the last decade or so, we have seen a rapid increase in the number of devices connecting to the home network. The popularity of IoT has meant that even devices that are not mobile require communication over the Internet, but, their placement might be far away from the primary router in the house. Given this situation, it is essential to find a reliable way to extend the reach of the home network. There have been many attempts to come up with a standardized way to do it, but consumers have been forced to use range extenders, powerline networking kits and the like to increase the reach of their home networks. Given the multitude of available options to extend the reach of home networks, what underlying technology should consumers look for? Today's article provides a comprehensive overview of the available options as well as a quantitative comparison in one particular residential scenario - a 1800 sq. ft. single-level California house built in the 1970s. A discussion of the various ways to extend home networks must always be prefaced with a simple suggestion - if it is at all possible to wire up the major rooms in the house with Cat 6 cables, the reader should definitely go for it. Wi-Fi access can then be made available in remote locations with the use of access points that piggy-back on the Cat 6 backbone. This article tackles situations where wiring up the residence with Cat 6 cables is not a practical option. Most residences have some sort of wired infrastructure going around - everyone has electrical wiring that is bound to be in every room. Some have telephone wires already present, while others have a coax cable network. In order to expand the reach of home networks, there are ways to use all of the above media. In addition to wired backhauls based on these, Wi-Fi itself can be used for this 'last feet' data transfer. Encompassing all these is the concept of hybrid networking - i.e., a way to get communication over different media to work together seamlessly in order to extend the network reach. The industry recognized the need for hybrid networking around 5 years back and set up the IEEE P1905 working group. The approach, mainly spearheaded by Qualcomm Atheros, involved usage of HomePlug powerline chipsets as well as MoCA (Multimedia-over-Coax Alliance) chipsets in Wi-Fi routers to ensure a seamless connected digital home. However, the added price for the functionality led to the vendors largely giving this endeavor a miss. As of 2016, there are no known hybrid networking packages in the market. 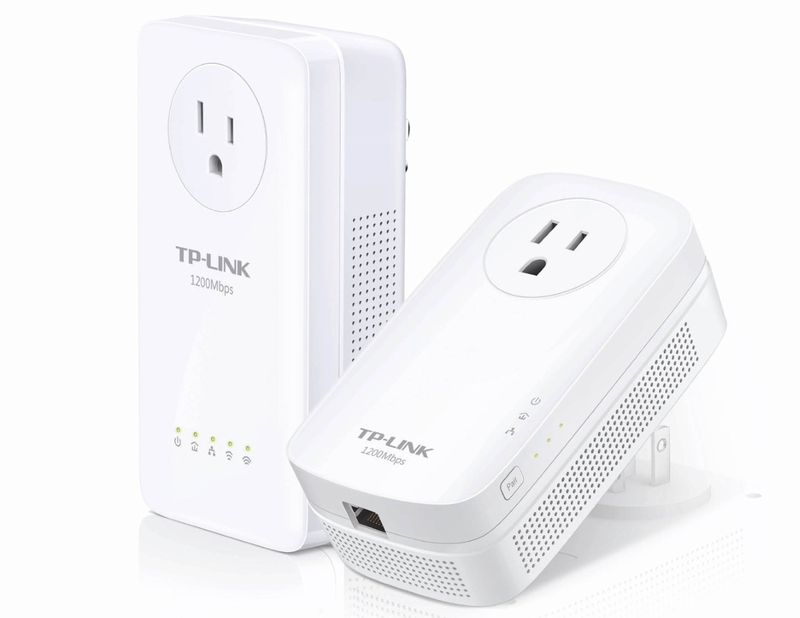 That said, there are many vendors who have range extenders that use a powerline backhaul (such as the TP-LINK AC1200 Wi-Fi Range Extender AV1200 Powerline Edition). 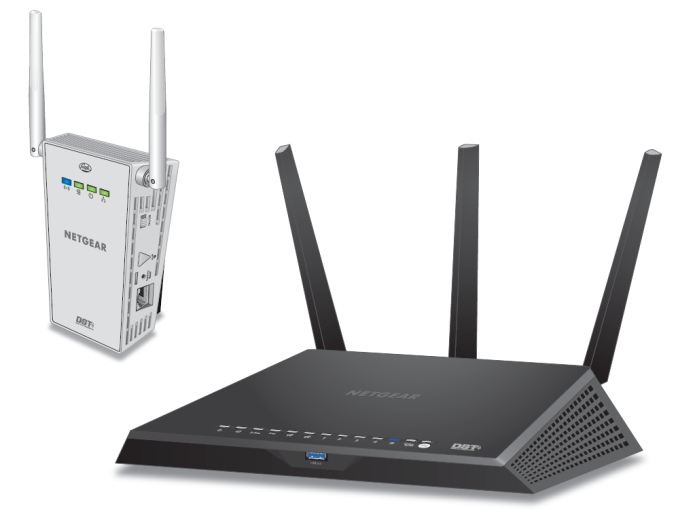 Even though these products fulfill the basic requirement of extending the home network, they are not marketed as a unified solution with a primary router. Netgear does have the Nighthawk DST (Dead Spot Terminator) kit hat combines a Nighthawk R7000 with a Broadcom-based HomePlug AV2-compliant PLC chipset. However, it is more of a limited release with the kit being sold only through Best Buy. ITU's G.hn (G.9960) specification for home networks has been of interest due to its ability to operate over different media (telephone wiring, coax cables, and power lines). The technology had only been on paper for a long time, but, in early 2015, we saw some powerline networking products based on G.hn appear in the retail market. Marvell Semiconductors is a big proponent of G.hn. The current G.hn powerline adapters in the market are all based on their chipsets. Recognizing the need for hybrid networking, ARRIS has made an attempt to integrate proven 802.11ac Wi-Fi solutions with Marvell's G.hn platform. The resulting product portfolio has enabled consumers to seamlessly extend the reach of their home networks. 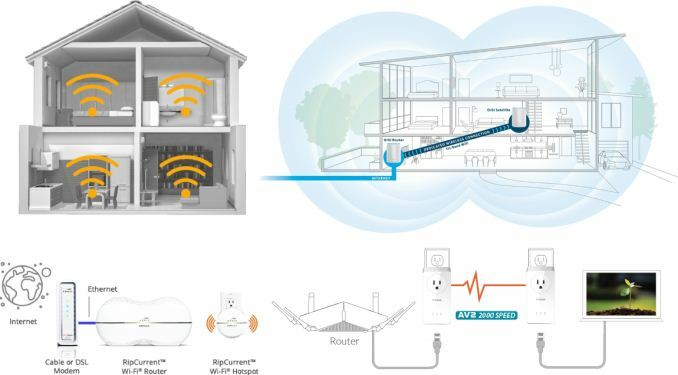 Marketed under the RipCurrent moniker, these products include a primary Wi-Fi router and optional powerline extenders as well as a Wi-Fi range extender with a powerline backhaul. They target homes that end up with Wi-Fi dead spots when a single router is deployed. The setup process and user experience are no longer bound by the traditional router configuration / usage interfaces. In a mobile-first world where the majority of the consumers prefer their experience to be dumbed down, many of the mesh Wi-Fi vendors have an app-based setup process and monitoring that focuses on basics and disregards advanced features. The ease of use has translated to popularity amongst consumers who are not tech-savvy. The basic operation models for wireless range extenders and mesh Wi-Fi router units are similar. 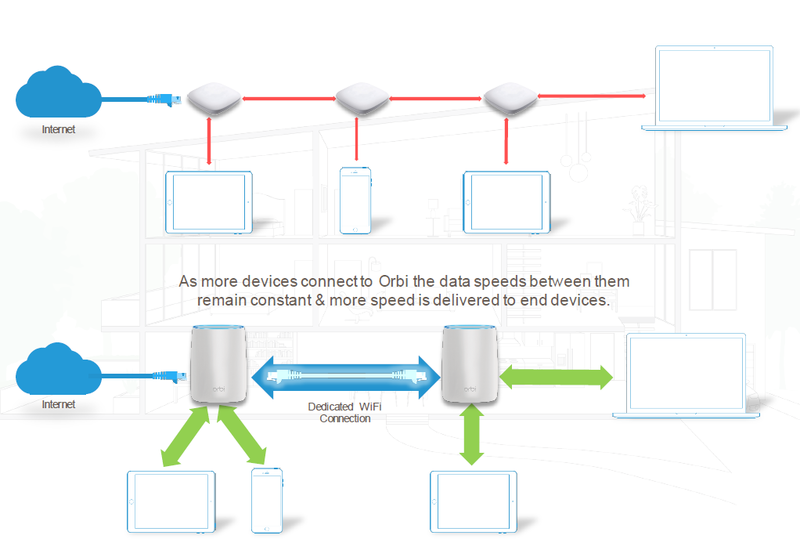 Some mesh systems such as the Netgear Orbi use a separate channel for the backhaul (communication between the member units). This ensures that there is no airtime wasted when there are active wireless clients. Mesh Wi-Fi systems can either adopt a 'spokes' model, with a primary router and the satellites talking directly to it, or, a 'real mesh' model where a node can have one or more hops to reach the primary router. The effectiveness of either approach is dependent on the location of the primary router relative to the dead spots in the house, as well as the number of member nodes. Most mesh Wi-Fi systems currently in the market are based on Qulacomm's Wi-Fi Self-Organizing-Networks (SON) solution. A detailed perusal of the technology makes it evident that it is the brains behind the marketing cloak of mesh Wi-Fi systems from Netgear, Google, Luma and eero. Readers now have a broad understanding of the various options available to extend the reach of home networks. In the next section, we will take a look at the various kits that were evaluated and the approach under which each of them falls. The evaluation methodology is also spelt out in detail. A couple of sections looking at the performance numbers is followed by some concluding remarks. Interesting comparison. Looks like you get flexibility or performance, but not both. It looks like the G.hn performance is what is hurting the ARRIS products, so it will be interesting to see what the next generation can do. I'm with you there, hard wired and ready for 10GbE (should it ever be cost effective). Still, sometimes plans change ("The TV looks better over... there!") and that's where I really like powerline-based networking. What, you didn't already run Cat 6 "over there"? For shame! You shouldn't need to move to a mesh system to get that functionality. "Enterprise" class APs like ubiquiti AC line offer zero-handoff roaming. Thats the setup I have. Ethernet to every room, and in a couple of strategically selected rooms I have two Ubiquity AC APs installed. Agree. I wasted money on 2 "good" APs (one was a router used as AP) before going with Ubiquiti.